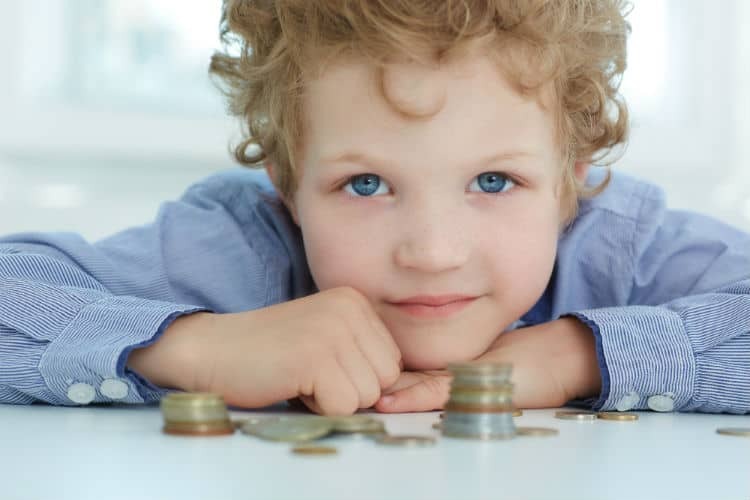 One of the most crucial topics that parents need to discuss with their kids is money: namely, the importance of earning and saving it, and how to spend it thoughtfully. That information and those skills will serve them well for their entire lives. We know that that might seem like a daunting task, so we offer 10 tips to help your family have productive conversations about money with preschool-, kindergarten-, and elementary-school-age children. By the age of 7, they understand, for example, that 1 dime is worth more than 6 pennies. Start to have conversations early with your children and in ways that are age-appropriate and answer their questions honestly. They’ll need to learn concepts like saving, budgeting, paying down debt, and giving. Your children will learn a lot about money from the way that you discuss it and the way that you spend it, so you want to make sure that you are modeling healthy money habits for them to emulate. What kind of conversations do you have with your spouse or other adults about money? When you go to the store, do you always use your credit card? A piece of plastic makes it harder for children to visualize the amount of money being spent. Instead of using a piggy bank to save all that loose change, get a clear jar. (They are also easier to get bills into!) A clear jar allows your child to see how much money is in the jar, and to appreciate adding more money to it and watching it become full. You can also pair this with a written tally on a piece of paper that you or your child can complete so that your child can both see how much money she has and also (more importantly) know its exact amount. When your children are able to figure out the increasing numerical value of the coins and bills that they’ve saved, they will appreciate their efforts to fill the jar. When your child asks to spend money from the money jar, help him count it out and have him accompany you to the store to make his purchase and pay for it. Or, if the jar isn’t quite full enough yet, bring him to the store while you run an errand and explain to him how much something costs and let him watch you pay the cashier. He will have a more concrete understanding of saving and spending money if you explain the amount of your purchase to him and he watches you complete the transaction. Give your children money for specific chores done (washing dishes, raking leaves, cleaning their rooms) rather than a weekly allowance just because it’s Friday again. This helps them understand that money is earned by doing work, not automatically given to them. When your child wants to spend money on something, help her understand the value of that purchase versus continuing to save money to buy something else later. She might have enough money for a new toy today, but that may mean not having enough spending money to bring on vacation next month. When your child has money in his wallet and asks to buy a toy that he sees at the store, encourage him to wait a day to decide whether he really wants it, especially if the purchase is more than $15. He’ll have time to consider making the purchase, and, as with Tip #6, he’ll be able to decide whether he actually wants the toy or wants to wait and continue to save his money to buy something else. When your older child has saved money, introduce her to the idea of giving a donation to a local charity, your house of worship, or other local nonprofit. She will begin to understand the importance of these organizations and the work that they do. She’ll also discover how giving money benefits the giver as well as the receiver. There are a variety of toys that you can use to help your child learn about saving and spending money, including cash registers, checkbooks, and play money. There are also a number of fiction and nonfiction books that are written to help children learn useful financial habits. While the above toys and books might be fun specifically for your children, you will probably discover during your conversations with them or your conversations with your partner that there are aspects of financial matters that you are not clear on. Use those moments as opportunities for your family to learn together. You’ll be communicating to your children that you do not have all of the answers about money, and that there is always the need to learn more. Parents, are you interested in a free reading evaluation for your child? Contact Read Smart, and let your child have the advantage with the top reading program in Tulsa!